You have decided to take your fitness goals to the next level by creating your own home gym. This is a worthy endeavor and you should be commended. Before you can start, though, you need to decide whether you will buy an incline weight bench or a flat weight bench. The flat bench can be used for a variety of exercises; you can sit, lay down or stand next to it. It is the piece of equipment that people know the best, and they trust it more. That is why the flat bench is one of the more popular pieces of equipment in the gym. For example, when lying on your back you can use it for a chest press; while sitting you can support your lower half while doing shoulder exercises; and if you stand next to the bench you can use it to support your body while doing rows for your back. Jeremy Gray from Muscle & Strength explains that the flat bench is an integral part of one of the most referenced benchmarks (no pun intended) of fitness: the bench press. Gray argues that the flat bench press is one of 3 exercises that are a must for all gym-goers. In addition to seated and supine movements, flat benches do double-duty as a platform for exercises such as step-ups and box jumps. If you do not have wooden boxes at your gym, a flat bench can fill in. 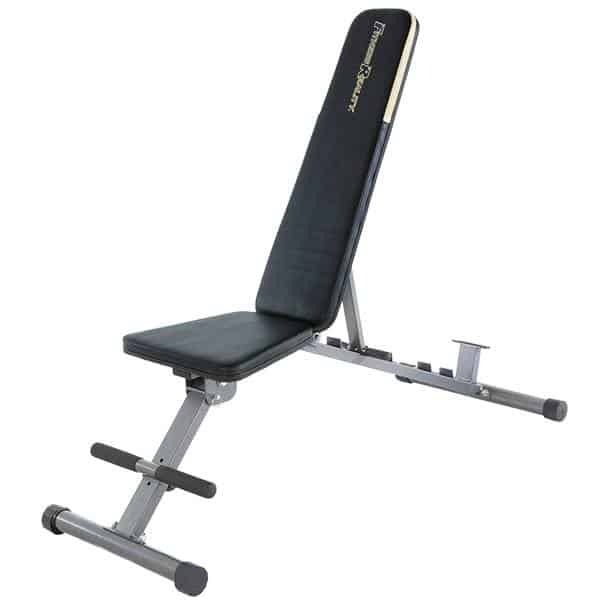 The flat bench press allows for a more natural and fluid movement, which makes it easy to use. Unfortunately, it can translate into a serious injury if you are not careful. You need to be safety conscious when using either bench. Usually, people use a spotter to help them. Your spotter should be a little bit more experienced than you so that they can show you where you are going wrong. Before starting out, take the time to learn proper form so that you do not injure yourself. Incline benches let us micro target specific muscles and extend the range of motion for exercises like bench presses. For example, performing presses on an incline bench can improve strength and conditioning of the clavicular head (the upper part of the chest) and shoulder activation. By working these muscles that are missed by more traditional movements we can get better results in physical appearance and strength. If there is one thing to learn from bodybuilding, it is that the ultimate physique depends as much on smaller intrinsic muscles as it does on the big major muscle groups. The incline also tends to involve your shoulders more, which means that you get a greater quality from your workout. Another benefit of incline benches is the ability to add resistance by going to decline. That means, instead of adjusting the incline bench to sit up, you move it to lay back at an angle lower than parallel to the floor. This makes you work harder to perform exercises like crunches and chest flyes against the pull of gravity. Like the incline position, they also work smaller muscles that are often under-activated. Since incline benches are adjustable, it is worth noting that they provide “the best of both worlds.” Meaning, you can adjust an incline bench to lay flat, or to sit up or back. Because incline benches are adjustable they may provide less stability for exercises like box jumps, but they can usually fill in for most flat bench movements. If you have an injury to your shoulders or chest, an incline bench may allow you to change your range of motion to accommodate. This can give your injured body part a little break while also strengthening support muscles around it to help protect it from re-injury. With any workout, it is wise to “listen to your body” and adjust or avoid exercises that cause pain or discomfort. Incline benches also tend to bulkier and cost more money. There are models that are aimed at home gyms, but they still tend to be pretty big. They also require more maintenance sine they have adjustable components that need to be taken care of. If you are starting out on an incline bench, you need to have a professional or experienced lifter help you come up with a balanced routine. If you are not balanced, this will lead to some serious problems later on. With both bench types, you need to learn the correct form before you can try lift heavier weights. As you start lifting seriously, you will need to find a spotter to make sure that you stay safe. On an incline bench, make sure that you do not arch your back. This will lead to serious injury and means that your load is too heavy. Conclusion – Which One Wins? This is difficult to say. Both have their pros and their cons. They also have different functions that play a huge role in your routine, and different problems if you are not careful. The end decision is up to you. Whether you are finding your way through the strength training section of your local gym or considering what equipment to buy to work out at home, a bench will probably be one of the go-to basics. You can get a great workout with either option. When it comes to range of motion and targeting intrinsic muscles, an incline bench provides the most versatility. When working out at the gym, use a flat bench for chest presses, flyes, step-ups, box jumps, hip thrusts, etc. The switch to an incline bench for a set to work every part of your chest and shoulders.